Announcing the fifth annual Tomatopalooza[tm] heirloom tomato tasting! Note the location has changed this year to a nearby farm in Efland, NC. 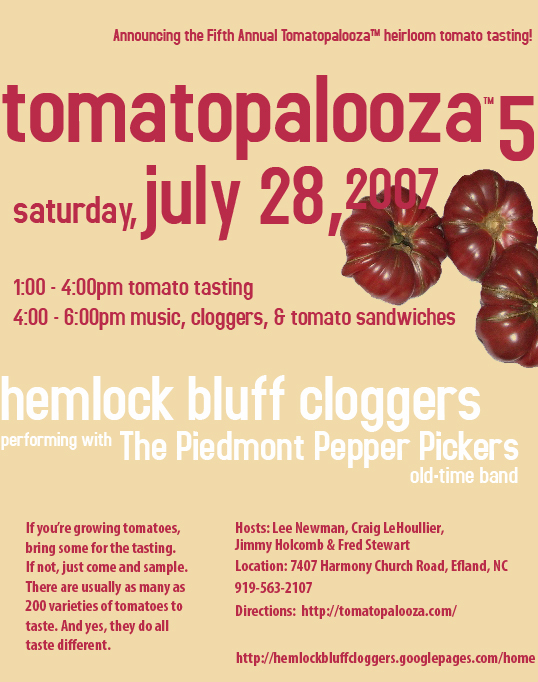 For more information go to the tomatopalooza[tm] web page below. Nice poster. I wish you a successful event! Here's the link for the pictures from the 2007 event. It's been a long and tiring day. Needless to say it was a great one! I will post about the event later, after I've had time to absorb it all. However, check out the new link for the 2nd best part of the event, the pictures! Looks like an incredible event! I wish I were there. Another album that was sent to me. Looks like y'all had a fabulous time and had a serious selection to wade through in the taste testing department. Wish I could've been there, but I'd already committed to working at the Windsor (ON) Pride event this weekend. After looking at all those pics I'm going to go crash in my hotel room and have visions of heirloom maters dancing in my head! Thanks for posting the pics. I'm glad yawl had a good time it looks like a 1966 gathering of the tribes reunion with all of the tie dye shirts. I'm also glad you all are back as the forum was dead while you guys were gone. I set Tomatoville back about 2 years with all of the misinformation and total lies I gave out. What an incredible day! Tomatopalooza V was quite a day (and a long one at that...though worth it in every respect). meeting Mischka, Rena, Suze, Feldon, Shelleybean for the first time - as well as other Tomatovillians such as Jim and Celticman and NCTim. (We are so happy that you intrepid travelers made the trip!). The warm hospitality and incredible venue provided by hosts Jimmy and Fred. It was absolultely perfect - even the unexpected strong late morning breeze and rain and rumbles of thunder were welcome. The food, the music, the dancing - it was day that was about so much more than tomato tasting. But the tomatoes - it was all kind of a blur, and I spent most of the time at the Dwarf Table - but people seemed to love them, it was an impressive collection, and the flavors were really good on the vast majority of what I ended up tasting. Well, it is off to bed for me. Safe travels to all returning home - let's do it again next year! Finally, thanks to Lee for all of the work that he put in to making this a great success. Relevant stats - probably approaching 200 tomatoes and over 120 attendees.....I am sure that Lee will have a more accurate tomato count soon. What a wonderful time we had today at Tomatopalooza. This was my 3rd trip and by far the most meaningful. It’s really heartwarming to be a part of the hospitality that was shared today at our gathering. I didn’t meet a stranger today. I was surrounded by genuinely good folk, that were eager to share their thoughts and smiles. My Uncle returned for his 2nd ‘palooza and each time I looked for him he was talking with someone. My friend Bob is already looking forward to coming back next year. It was great to see familiar friends like Craig and Lee and others that I recognized from past trips but it was especially nice to have met those that I had not met before. I heard it said many times today how nice it is to associate a face with a screen name and I agree. I know I didn’t talk everyone that was there that posts here, but I did talk to some. I spent a few minutes talking with Mischka and no longer think of him as the Wizard of Oz. Mischka is very friendly and unbelievably easy to talk with. It’s no wonder he has been so successful in his endeavors. I was very happy to met and speak with Suze. She has been very kind to me and if memory serves me, she is the person who invited me first to Tomatoville. It was a pleasure to meet Rena and Morgan as well. The fact that all of you went to such lengths to attend speaks highly of your sincerity. Jim and his grandson, both from Columbia S.C., had a wonderful story to share about how Jim’s interest in gardening has been picked up by the grandson. Next year I need to try growing Ashley cucumber. So my thanks go out to Craig, Lee and our host Jimmy Holcomb, as well as their spouses. My favorite tomato today was Little Lucky and Rasp Red. Black Scorpion wins the hot pepper award. Thanks to Michele and Carol I was represented in "spirit" with the Lime Green Salad Sorbet. And also thanks to Michele (Happy Birthday to you Shelleybean) I was able to hold a mini tasting with Elfie (yummmmm). I'm inking in the last Saturday in July 2008 for Tomatopalooza [tm] VI!! Some pictures (I always set out to take lots, but get caught up in slicing, tasting and talking tomatoes.....oh well - glad there are others better than I at photodocumenting these events!). Congratulations to the hosts for successful and fun filled event! Lee, Craig, Jimmy, and others -- it was a pleasure finally getting to meet and put a face with a name. While I didn't get to taste every single tomato, I did get to try several, and the some of the real standouts from the dwarf table included Sneezy F3 Summertime Green RL 2, Tipsy F1, and Sleezy B F3 Bruce's Purple RL1. Other standouts included an (unknown) German heirloom, Little Lucky, and Andrew Rahart's Jumbo Red. Merged pictures taken by Craig. Thanks, Martha! I had a great birthday. Thanks to Rena's scoopnig , Carol and I were able to serve the sorbet and everybody loved it.